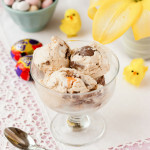 Easy no-churn Cadbury Creme Egg ice cream is delicious, simple to make and another great way to enjoy this popular Easter chocolate treat. Only three ingredients and no ice cream maker required! 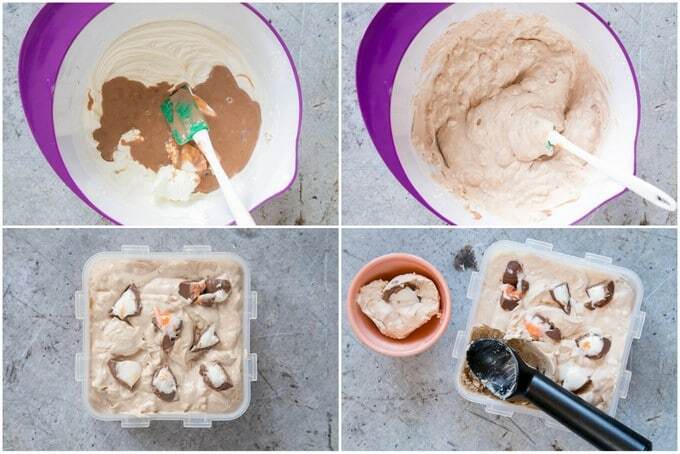 This creme egg ice cream is no churn – meaning you don’t need an ice cream machine – and only has three ingredients. It is also quick – hands on time is about 10 minutes. This ice cream is far cheaper to make than buying from the store, which means more money for creme eggs! The recipe uses one standard 300 ml carton of cream and half a 197 g can of condensed milk. This makes it easy to scale with no leftovers. 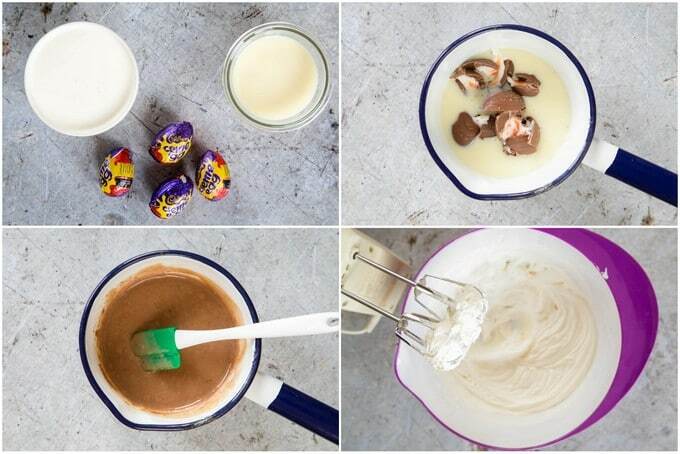 Step one – Gather your three ingredients – 1 x 300 ml pot of cream, half a can of condensed milk and 4 creme eggs. You will also need an electric whisk, a small pan, a spatula and a 1 litre (33 oz) freezer-safe tub. Step two – Chop two of the creme eggs, put into the pan with the condensed milk, and gently heat until the chocolate has melted. Step three – Set the mixture to one side and allow to cool. Step four – Use an electric mixer and whip the cream until if forms soft peaks. There is no need for a stand mixer here; you can whisk by hand, or buy an electric mixer for less than £10. Step five – Add the cooled chocolate mixture to the whipped cream. IMPORTANT – The condensed milk and creme egg mix MUST be cold before you add it to the cream. Otherwise the whipped cream will collapse and it will not whip up again. Don’t be tempted to save time here; you will have to throw everything away and start again. Step six – Gently fold together. Step seven – Transfer the cream mixture to a freezer-safe plastic tub. Cut the remaining 2 creme eggs into 8 and stir through, keeping a few segments to garnish the ice cream with. Step eight – Freeze overnight, then enjoy! Quantities are designed around a UK standard 300 ml pot of double cream and half a 197 g can of condensed milk. Make this extra chocolatey by adding some dark chocolate to the condensed milk along with the creme eggs. Decorate the ice cream with crushed mini eggs or other Easter chocolate before freezing. This ice cream will keep for about 2 weeks in a domestic freezer before it starts to loose some of its texture. Leftover condensed milk can be frozen and used for the next batch. Make sure that you either keep the tub upright or have a watertight lid, as condensed milk doesn’t freeze solid. It will seep out of all but the most tightly sealed containers and turn your entire freezer into a sticky mess. You have used evaporated rather than condensed milk – easily done – I’ve bought the wrong can in the store too. The condensed milk and creme egg mixture wasn’t completely cool when you added the whipped cream. You stirred in the condensed milk mixture rather than gently folded it. This is usually because you have over whipped it. You can usually rescue it by adding a tablespoon of milk and whisking in on the slowest speed. If you try this Easy no-churn Cadbury Creme Egg ice cream please tag #FussFreeFlavours on Instagram or Twitter. It is amazing for me when for me when you make one of my recipes and I really do love to see them. You can also share it on my Facebook page. Please pin this recipe to Pinterest too! Thanks for reading Fuss Free Flavours! 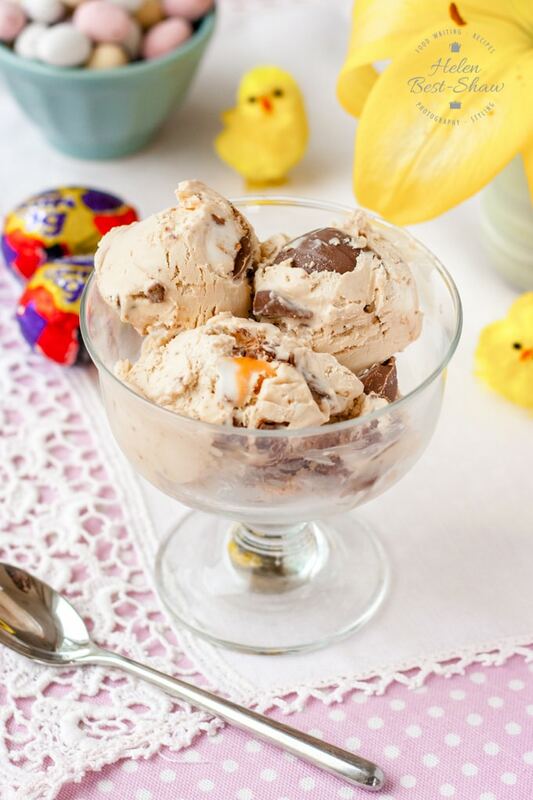 Easy no-churn Cadbury Creme Egg ice cream is delicious, simple to make and a great way to enjoy the favourite Easter treat. Only three ingredients and no ice cream maker required! Put the condensed milk and 2 of the Cadbury Creme Eggs into a small saucepan. Heat gently, stirring until the eggs have melted and you have a smooth chocolate mixture. Set to one side and allow to cool completely. Using an electric mixer, whip the cream until it holds a peak, but is still soft – if you over whip it, add some milk to soften it. 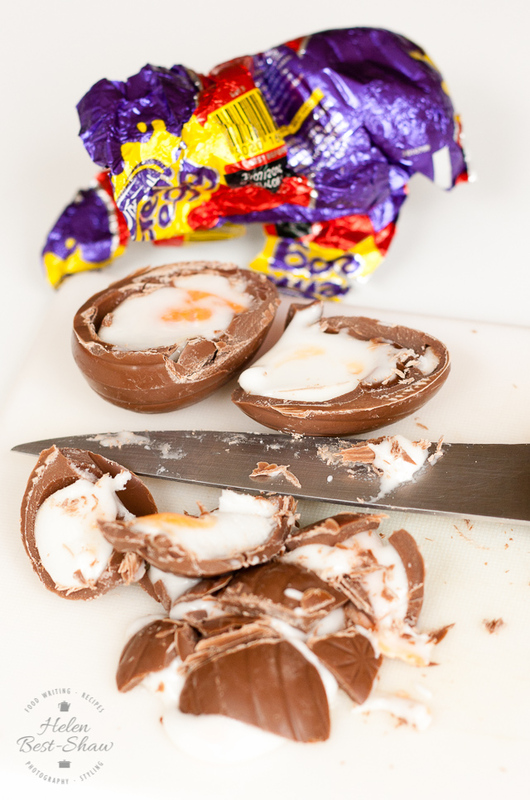 Chop up the remaining 2 Cadbury Creme Eggs into small pieces. Fold the cold chocolate mixture and chopped eggs into the whipped cream until well mixed. Spoon into a freezer-proof container, cover and freeze for 24 hours. It is vital to let the chocolate and condensed milk mixture cool completely BEFORE you add it to the whipped cream. Keeps for 2 weeks in a sealed container in a domestic freezer - any longer than this and the texture will deteriorate. Leftover condensed milk can be frozen.